I’m currently working on this in STAC. 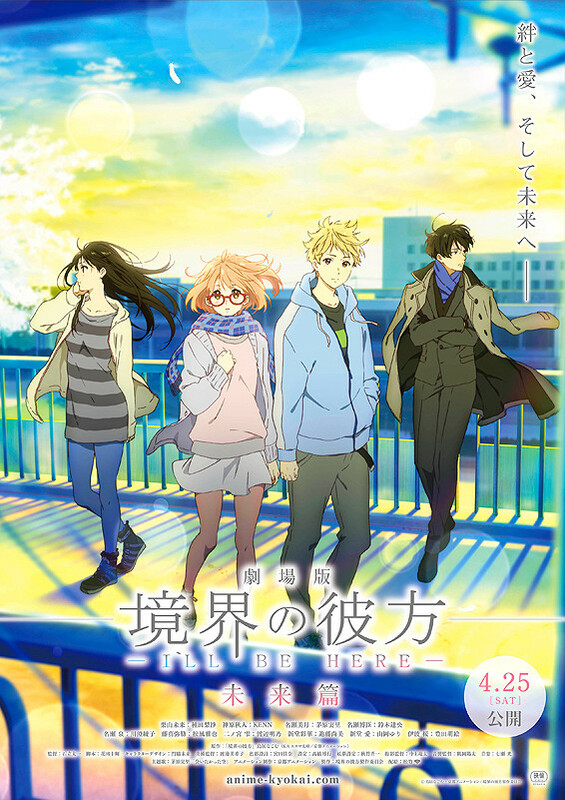 It’s a fake poster for Kyoukai no Kanata: I’ll Be Here, a two-part anime film project based on the anime and light-novel Kyoukai no Kanata (or Beyond the Boundary in English). Akihito Kanbara is a high school sophomore in the literature club who believes himself to be a “Meganest”, and although he appears to be human, he is actually half Yōmu, which makes him invulnerable to wounds, due to the fact that he can heal so quickly, and also immortal. One day, Akihito meets freshman Mirai Kuriyama when it appears as if she is about to attempt suicide by jumping off of the school rooftop. Mirai is isolated because of her ability to manipulate blood, which is considered heresy even among other members of the underworld, so she is shunned. Soon after Akihito saves Mirai, disturbing events begin to arise. The first film Kako-hen retells the events of the television series, while the second film Mirai-hen is an original story set one year after the end of the anime series. I did like the anime and the second movie (both made me cry, first movie doesn’t count since it just replays the anime). I already had a plan of how the poster should look like before I started drawing. The glasses (that are going to be red) belongs the the female protagonist Mirai. Through the lens you see Mirai and Akihito but you don’t see their eyes. The background was going to be some kind of sunset inspired by the original posters for the films. I used water color and did a few tests on what I should use. Next Next post: A Personality Test?